Enchanted Rock State Natural Area, Llano County, Texas. Hwy 16 South for 14 miles, then west on Ranch Road 965. Located twenty miles north of Fredericksburg in the southwestern region of Llano County, Enchanted Rock serves as the geological center of the Lone State State. Scientists classify the pink granite dome as a monadnock, an isolated rock formation which has been pushed above ground by hardened magma rock called a batholith. A Monadnocks is actually a part of the batholith that pushed it upward past the surface. 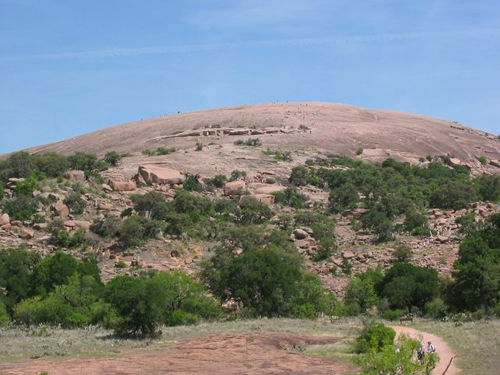 The one responsible for Enchanted Rock is named the Town Mountain Granite. "View of Enchanted Rock from base camp." The second largest monadnock in the nation, eclipsed only by Stone Mountain in Georgia near Atlanta, Enchanted Rock is the centerpiece of a state park covering 1,643 acres. Enchanted Rock State Natural Area is home to more than four hundred archaeological sites, five hundred plant species, and a chain of small granite domes. Considered a national landmark and archaeological district, the park annually receives more than 250,000 visitors. Enchanted Rock acquired its name from the early inhabitants of the region. They witnessed strange, eerie lights and fires coming from the top of the structure. Those who approached it also claimed to hear cries and groans filling the air. They attributed such things to magic and the supernatural. According to scientists, the lights and fires could have been the moonlight shining off the rock's surface after a good rain storm. Layers of rock contracting during cool temperatures after being subjected to heat would account for the unusual noises. 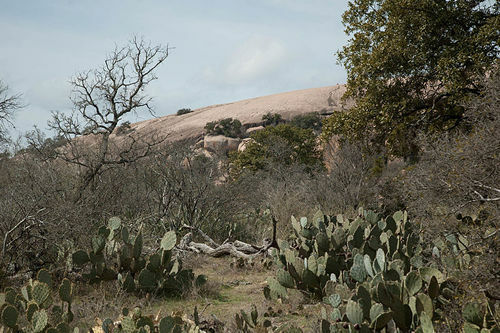 The first settlers of the Enchanted Rock region arrived at the scene 11,000 years ago. Although no identification has been given to the inhabitants, archaeologists determined the society was divided into hunters and gatherers and served as a heavy influence on the tribes of the Plains Indians. These ancestors literally left their mark on Enchanted Rock by making strong depressions in the structure as they prepared their food. The Tonkawa tribe, which name means "they all stay together", became the first known Native Americans to occupy Enchanted Rock and its surroundings. The Tonkawa society was founded during the 1400s in Texas and Oklahoma. However, the people didn't move into the Llano area until the sixteenth century. The Tonkawa continued to thrive until disease and war against the Apache weakened their numbers. The war itself was made worse by the fact that the Tonkawa alienated themselves from other tribes by the practice of cannibalism. The Apache succeeded in driving them away from Enchanted Rock during the 1700s, who were then replaced by the Comanche near the end of the same century. The three tribes had many superstitions pertaining to the granite dome such as the belief that the rock served as a portal to unknown worlds, invisibility could be obtained at night on the structure, and bad things would happen to those who climbed it with evil intentions in their heart. They also contributed legends and ghost stories. Indentations on the apex of the rock were actually the footprints of an Indian chief's spirit forced to walk along the top for all eternity because he had sacrificed his daughter. Phantom warriors of an extinct tribe haunted the rock after unsuccessfully defending themselves against enemy foes. Following the slaughter of her people, a princess committed suicide, causing her spirit to roam the area. Spanish exploration into Texas started with Alvar Nunez Cabeza de Vaca in 1536. Although the expedition entered the region, it went nowhere near the hill country. Other Spaniards spread stories and rumors of wealth. Enchanted Rock itself was referenced as a large clump of silver or iron, depending on the storyteller. Regardless, the Spanish government showed little interest in Texas until the French established a colony at Fort St. Louis near Matagorda Bay in 1685. Despite the colony's failure, Spain went into action and established several missions in the San Antonio area. Officials then focused their attention on the hill country, hoping to find a suitable place to build an outpost and convert the Apache to Christianity. The warriors near the fortification would serve as a protective barrier to prevent Comanche attacks on San Antonio. In 1753, Lieutenant Juan Galvan led an expedition to find a place to erect a mission. He explored the Pedernales and Llano Rivers before arriving at the San Saba. Galvan felt he had found the perfect spot, but he later sent a second team to back up his findings. When the men came back, they returned with Indian tales of the Hill of Red Ochre. Rumors immediately spread about the possibility of gold and silver in the Llano region. Enchanted Rock received some attention, but the majority went elsewhere. There were many legends that arose during the time of Spanish rule. According to one account, the Tonkawa captured a conquistador. He escaped, however, by hiding on Enchanted Rock. The man later claimed that the rock had conjured some kind of magic spell. In another tale, a group of Indians pursued a priest all the way to the rock. The priest fell into a cavern and spent two days going through its tunnels and meeting several ghosts. The most famous legend involved a soldier named Don Jesus Navarro. He traveled to a mission in San Antonio and fell in love with a young Indian maiden called Rosa. The daughter of Chief Tehuan, she was abducted by a group of Comanche warriors. Just as they were about to burn her alive at the stake on Enchanted Rock, Navarro arrived on the scene and rescued his true love. "Vernal pool at the top of Enchanted Rock in 1998." In 1821, the Mexican people won their independence from the Spanish governement and set up a new republic. The new leaders wanted to protect the northern territories from the westward expansion that was taking place. To this end, they decided to populate the area with more settlers. The government tried appealing to Europeans first, but failed in the endeavor. The only option left, ironically, was the recruitment of Americans. Stephen F. Austin led the first group of settlers in 1822 and founded San Felipe de Austin. The colonists soon found themselves facing the fierce Indian tribes, especially in the hill country. In addition to the deadly Comanche of the region, the families had to deal with a mixture of Cherokee, Shawnee, Caddo, Kiowa, Arapaho, Cheyenne, and Apache. This did not deter the new inhabitants, thanks to the stories of mines containing gold and silver along the Llano and San Saba River. The constant friction with the Indians often led to the spreading of rumors regarding Enchanted Rock. Tales surfaced of the Comanche performing ritual sacrifices on the rock. These attempts to vilify the tribes were sometimes accompanied by stories about their reverence toward the rock. All of them involved the narrator trying to escape certain death from the Indians. In each case, the storyteller would reach the safety of Enchanted Rock, a place where the pursuers would stop and end the chase, sometimes refusing to fire their arrows. The most famous legend during this time involved some Indians who kidnapped a woman. The lady managed to escape and sought a place to hide. After reaching Enchanted Rock, she stayed there until she died from starvation. Many people claimed they could hear screams at night when they got near the rock. In 1829, Captain Henry S. Brown went on an expedition to hunt down the Indians responsible for attacking and terrorizing Austin's colony. He had two successful battles along the journey, the second one taking place at Enchanted Rock. When he returned from the long trek, Brown gave a detailed description of the granite dome and received credit for discovering it. The Texas Revolution came to a successful conclusion in 1836 after the Battle of San Jacinto. News of a new government did not end the excitement over the possibility of discovering rich mines. Speculators and surveyors flooded Indian territory, causing deeper conflict with the settlers. This growing ordeal made ownership of Enchanted Rock an impossibility. 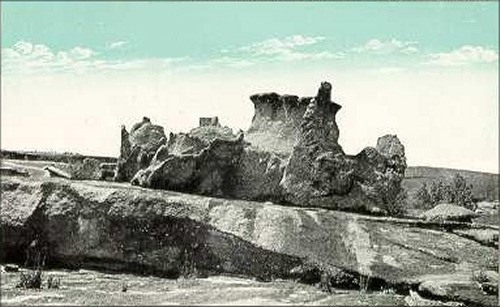 Nevertheless, Anavato Martinez and his wife Maria Jesusa Trevino managed to secure a deed to the natural formation and its surrounding area in March 1838. Later that same year, James Webster and his family made a trip to obtain a headright, but a group of Comanche led by Chief Buffalo Hump attacked them. They killed everyone except the wife and two of her children. Before anyone could come to the rescue, the chief split up his forces and met again at Enchanted Rock. Two years later, the captives managed to escape and found their way to San Antonio. It was there that she started telling about gold, silver, and diamonds. Adding veracity to her claims a year later in 1841, a British diplomat William Kennedy published a book called Texas after he had visited the state to explore the frontier and hopefully find some riches. The book became successful and enticed Germans to immigrate to the new nation. In addition to the book publication, the year of 1841 saw a legendary tale unfold, thanks to the actions of a Texas Ranger. Born in Tennessee, John Coffee Hays began a career as a surveyor in Mississippi. He returned to Tennessee briefly to attend Davidson Academy then moved to Texas to join the revolution. Following the advice of Sam Houston, Hays joined a group of rangers under the leadership of Erastus Smith and soon found himself promoted to the rank of sergeant. After the war, Hays mixed his surveying duties with his military ones. Hays became a captain in 1840, often helping citizens and Indian allies fight against Mexicans and Comanches. On one fateful day, Captain Hays went on a scouting expeditions for some surveyors. Everything was going well until he found himself separated from his team. As luck would have it, a large group of Comanches appeared on the scene and attacked the lone figure at the base of Enchanted Rock. Hays pulled out his colt revolver, firing it as he retreated of the ragged dome. He found a crevice then turned around to face his pursuers. He fired upon the Indians, standing his ground for three hours. Single-handedly, Hays fended off the Indians until his group was able to join the fray. The Comanche decided to leave the area, not wanting to increase the number of casualties. Despite the dangers illustrated with this tale, people continued to show interest in the Llano region. Anavato Martinez sold ownership of Enchanted Rock and its surrounding area to James W. Robinson in October 1841. During the Texas Revolution, the former politician had served as the lieutenant governor in 1835 then took the governor's seat in 1836. Robinson spent the rest of his career as a district judge of the Texas Supreme Court. Three years after Robinson acquired the property, his business partner Samuel Maverick bought the land in hopes that it would bring him more wealth. A politician and land baron, he earned the reputation of being independent by refusing to brand his cattle. The locals of Matagorda Bay began calling them mavericks and a new term was born. Taxation, overpopulation, and signs of autocracy led many citizens to seek refuge from the German Confederation, a group of 39 states brought together by the Congress of Vienna after Napoleon had been defeated. To help accomplish this goal, several noblemen led by Prince Solms formed an organization called the Society for the Protection of German Immigrants in Texas during April 1842. Feeling that Texas was the perfect place for a new life, the commissioner general made a down payment on a land grant acquired by Henry Francis Fischer and Burchard Miller. Unfortunately for the Germans, the grant covered 1,735,200 acres of Indian territory, effectively making the area uninhabitable. The immigrants arrived in Galveston in July 1844 then started their journey to Indianola. From there, they planned to move onward to the Ficscher-Miller Land Grant. However, Captain John Hays convinced Prince Solmes that the settlers would not have the time to make the journey and establish the colony before winter started. Solmes bought two leagues of land northeast of San Antonio near Comal Springs. This led to the establishment of New Braunfels. John O. Meusebach took over the commissioner general position in 1844 and arrived in Galveston the following year. The job had become too burdensome for Prince Solmes, who felt overburdened with all the responsibilities that came with it. The organization was on the brink of bankruptcy from financial management while 439 settlers waited to make the final leg of the journey. On top of all this, the Comanche roamed the prospective land which had to be occupied by August 1847. Failure to miss the deadline would mean termination of the contract and the end of their colonization efforts. In response to the deadline, Meusebach founded Fredericksburg in May 1846, then began an expedition to make peace with the Comanche in January 1847. He met with tribe leaders Old Owl, Santa Anna, and Buffalo Hump two months later and succeeded in making a treaty. The Germans obtained permission to settle in an area of 3,878,000 acres without fearing Comanche aggression in exchange for 3,000 dollars worth of gifts. Furthermore, the tribe would protect them from other Indians if they helped the Comanche against horse thefts and other crimes committed by enemy tribes. This agreement led to the establishment of Concho, Kimble, Llano, Mason, Menard, McCulloch, San Saba, Schleicher, Sutton, and Tom Green counties. In addition, Enchanted Rock and the surrounding region would no longer experience aggression from the Comanche tribe. Samuel Maverick's wife sold the land rights to Enchanted Rock to N. P. P. Browne around 1880, but she insisted on keeping the mineral rights. Six years later, John R. Moss bought it then gave the ownership to C. T. Moss, J. D. Slaytor, and A. F. Moss in 1887. Slaytor relinquished his share of the land in 1896. Although the Moss Family maintained control, the members allowed the rock and the surrounding area to be used for church gatherings, concerts, parties, picnics, and other public functions. When Tate Moss gained ownership in 1927, he made Enchanted Rock a privately-operated park and opened it to the general public. During 1946, Albert Faltin purchased the ranite dome then sold half of the ownership to Charles H. Moss in 1947. Charles kept the rights until 1978. That fateful year in March, Charles Moss announced that he would be selling Enchanted Rock. He first went to the Texas Parks and Wildlife Department, but the asking price of 1.3 million dollars was too expensive. After the rejection, a multitude of rock quarry companies and development firms appeared on the scene. There was even an offer to transform the dome into a monument similar to Mount Rushmore. "Enchanted Rock as viewed from the trail leading to the summit. People climbing on the summit (visible as dots) give an idea of the scale of the granite rock." Lady Bird Johnson, the widowed wife of former president Lyndon B. Johnson, decided to come to the rescue. She contacted The Nature Conservancy and persuaded the non-profit organization to buy Enchanted Rock. The Nature Conservancy then gave the land to the State of Texas, which took control in June after adding three acres to the property. In October 1978, the government opened Enchanted Rock to the pubic as a state natural area. The Texas Parks and Wildlife Department closed Enchanted Rock in 1982 to make improvements. These changes included tent sites, picnic areas, campsites, hiking trails, and a visitor center. Eighteen months later, the park reopened and was added to the National Registry of Archaeological Sites. 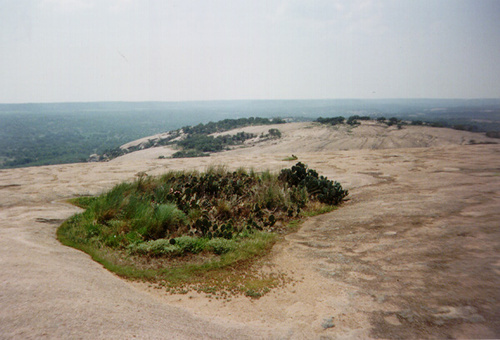 The Friends of Enchanted Rock was formed during the late 1990s and took on the task of raising money to help maintain the park. The granite formation attracts more than 250,000 people each year. Enchanted Rock and other state parks in Texas, please submit here.